The MOLO Lipno Resort offers spacious apartments with elaborated layouts, which provide a functional space for a vibrant and active life. At MOLO Lipno Resort, we use the top-quality materials and we put emphasis on every detail, from the above-standard size of the parking places e.g. to the cooling of the entire apartment area. 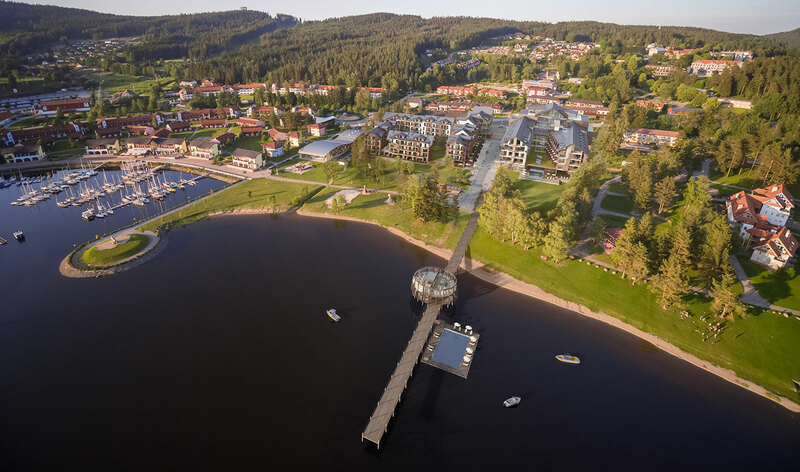 MOLO Lipno Resort – browse through the visualizations, enjoy the atmosphere of Lipno and the Bohemian Forest (“Šumava”). If you are regularly online, please follow us on Facebook and Instagram. If you are interested in an apartment in the MOLO Lipno Resort, please do not hesitate to contact the exclusive real estate agent, LUXENT Exclusive Properties. Also, please follow us on social networks – Facebook and Instagram. In the MOLO Lipno Resort, safety and high standard represent our priority. The entrances to the apartment buildings and the garage entrances are secured by an electronic entry system. For the apartment complex there will be a separate reception with basic concierge services and with security service. The resort residents can also use the reception services of the neighbouring five-star hotel. Both reception are available in the 24/7/365 mode. Thanks to the division of the houses into sections with separate staircases and elevators, there are no more than three entrances to the apartment on a common corridor. The underground floors include garages, cellars, and also bicycle storage rooms and cubicles for sports equipment. All the living rooms in the apartments are equipped with cooling by internal circulating units, mounted on the walls or on the ceilings. The apartment entrances are fitted with safety anti-fire doors. The floors in the living rooms are wooden ones, the standard of the bathrooms and chambers includes large-format designer tiles. The large-format French windows are on the side of all the balconies and terraces and they offer beautiful views of the lake or of the garden, designed by the well known garden architect Štěpánka Šmídová. Between the residential buildings and the hotel, there is a promenade with shops and a café, leading to the majestic, 150-meter-long pier (“molo” in Czech), which is one of the dominant features of the project. The pier will offer a beautiful atmosphere; and your evening romantic walks can be enhanced by a stopover at the Molo Club Restaurant where you can refresh yourself with a drink or a dinner, overlooking the sunset. At the Molo, there will also be a heated swimming pool with clean, filtered water. MOLO Lipno Resort – your second home! The garden will be planted with grown trees, which will provide shade and create a unique atmosphere. The entrance doors to the apartments are safety (safety class RC3), fitted with a panoramic peephole, generally with a door width of 900/2.200 mm. Fitting is also safety, class BT3, outside the door there is a doorknob, inside a handle. The doors are fire-proof and single-wing. The interior doors are non-fold, lacquered or with a wooden veneer, usually 2.200 mm high. According to the character of the room which is entered through the concrete door, the doors are full or glazed. The window construction will be with an insulating glass. The windows will be micro-ventilated. On the side of the balconies, terraces and loggias (enclosed balconies) there are large-format French windows and doors that are openable or tilted. The glazing is clear. The balcony rails will be glazed with a stainless steel finish. The drainage is executed under the tread layers along the laid-out insulation layer. The gypsum plaster or screeds will be in all the living rooms, kitchens, and entrance vestibules. The bathrooms and toilets will be equipped with a large wall covering up to the ceiling. The living rooms, including the kitchenette and vestibule, will have a wooden glued multilayered floor. Large-format ceramic tiles will be laid in the bathrooms and toilets. Ceramic tiles will be laid in a suitable extent behind the entrance doors and in the chambers. The balconies, loggias and terraces will be fitted with wooden decks. In the area of the front gardens there will be outdoor tiles or a pebble surface. The bathrooms will be fitted with premium fixtures, e.g. by Villeroy & Boch, Kaldewei and Hüppe. The toilets will be hung, the tanks integrated into the walls under the tiling with a two-push mechanical flushing control. For selected lavatories, there will be a preparation for a toilet with a bidet and a bidet shower. The faucets of the washbasins will be standing and lever. Selected shower enclosures will be fitted with thermostatic taps. Selected bathrooms will feature infrasaunas or Finnish saunas. The bathrooms will be fitted with heating ladders. The heating of the apartments is provided by the central boiler room of the building. Each apartment is connected to a residential heat exchanger, allowing a spatial control of heating and ensuring the heating of domestic hot water too. The radiators will be equipped with a thermostatic head. The bathrooms feature the heating ladders. The bathrooms will also be fitted with an electric floor heating. The apartments will be equipped with the ventilation of the lavatories and bathrooms. An exhaust with a tight non-return flap will be prepared prior to the installation of a hood. The pipeline distribution will be rated at a flow rate of at least 300m3/h on a hood with a 75% concurrency. All the living rooms in the apartments will be equipped with cooling by means of internal circulating units, mounted on the wall or on the ceiling. The cooling system will be connected to the central sources of cold, located on the underground floors of the building. The cooling system will be equipped with a control system that will allow for the distribution of energy consumption for each apartment´s cooling. In the kitchen, the connection will be terminated by the terminals in the corner at the planned position of the kitchen unit. The standard includes the lighting of the bathrooms, toilets and corridors. The lighting fixtures of the living rooms, balconies, kitchens and kitchenettes are not fitted and the outlets will be prepared for them according to the project. In the event of a power grid failure, the supply of electricity is not ensured. The home switchboard will contain a minimum protection of 3 x 25 A. The rooms in the apartments are equipped with heavy-current sockets. 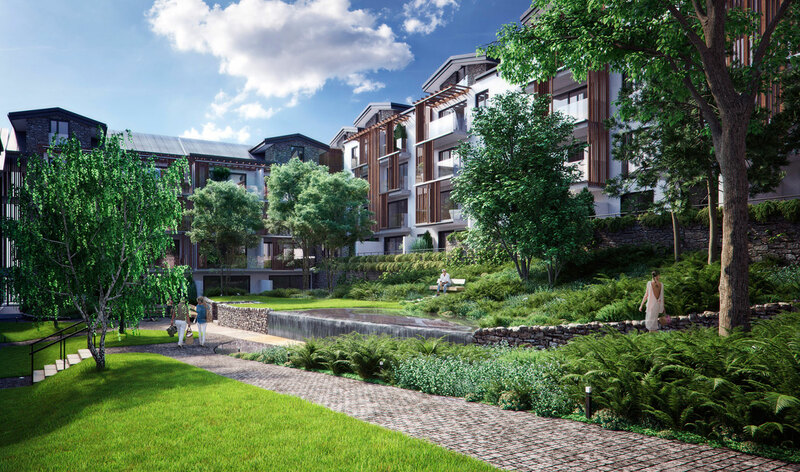 Each apartment will be supplied with a low-voltage distribution, to which the apartment's distribution will be connected according to the project. In the living room there will be one TV socket and one data socket (for connecting RJ45 end elements). The transmission of television broadcasting will be solved by a central antenna for a satellite or terrestrial signal reception, or via a cable television provider. The apartments will be equipped with an electric door keeper, which will be located in the vestibule of the apartment. The apartment bell will be autonomous and connected directly to the home intercom. A reinforced concrete monolithic construction in combination with a brick wall system. The sloping roofs will be made of a supporting structure in the form of reinforced concrete slabs, on which a spacing (distance) grid will be placed and thermal insulation will be inserted into this grid. The cover of the roof will be iron and folded. A combination of ceramic masonry, monolithic concrete structure and external insulation, on which a stone and wood cladding and a plaster will be placed. The walls between the apartments are made of bricks or reinforced concrete. The internal partitions are also bricked, in some places made of reinforced concrete with a retention wall. The installation overlapping walls are made of plasterboard. The ceilings are made of reinforced concrete with a gypsum plaster or a screed on the facing (visible) side. The plasterboard soffits are in the common areas and in the bathrooms, toilets, corridors and chambers. The walls in the common areas of the building (except the walls on the underground floors) are made with an internal single-layer plaster on a gypsum base, in some places with a ceramic tiling. The entrances to the building will feature a cleaning zone. The floors of the entrances and common areas, corridors, escape routes, elevator platforms, staircases and staircase platforms on the above-ground floors will be made of ceramic tiles. The floors in the garages, the ramps, the floors of the technical rooms etc. will be made of concrete. The doors into the building will be glazed, single-leaf, aluminium. They will be fitted with a security lock with an electronically controlled access (by magnetic card or chip). The garage doors will be opened by chip card, equipped with security features and installed with a reduced assembly kit. A column with an intercom for communicating with the reception will be installed at the entrance to the garage. There will be 9 personal lifts in the building. They will be equipped with a large-format mirror and ceiling lights. These lifts are not of the evacuation type. The reinforced concrete shafts are resiliently separated from other load-bearing structures. The common garden will be partially grassed, planted with appropriate local vegetation. A water supply will be provided for the common garden area to allow irrigation. The lighting of the corridors, routes and garages is controlled by motion sensors. The control of the lighting in cellar cubicles will be switched by sections, which will be controlled by switches places near the entrances. The control of the other rooms (the basement facilities) will be local, by switches at the entrance to the room. The walkways and passage of the building are illuminated by lights that will be switched automatically. At night the lighting will be reduced to a low intensity or completely switched off in order not to disturb the residents of the building. The majority of the apartments are designed with the saunas as a standard feature. And selected apartments will even include Finnish saunas. Most of the apartments have extra spacious balconies or terraces with a dining and sitting area. The apartments on the first floor feature front yards. All the apartments have cellars and most of them also sports equipment cubicles. We pay attention to every detail. The ramps and entrances are specially designed for low sports car suspensions, and spacious parking spaces can conveniently accommodate large SUVs or L versions of limousines. There will also be a charging stations for electromobiles in the garages. Autumn evenings by the fireplace will bring about a unique atmosphere. All the apartments and their living rooms are equipped with cooling. The window openings are prepared for external shading with an electric control. Most of the balconies and terraces are protected by wooden elements. The toilets, bidets and washbasins, fittings will be equipped by brands like Villeroy & Boch brand, Kaldewei, Hansgrohe and Hüppe. 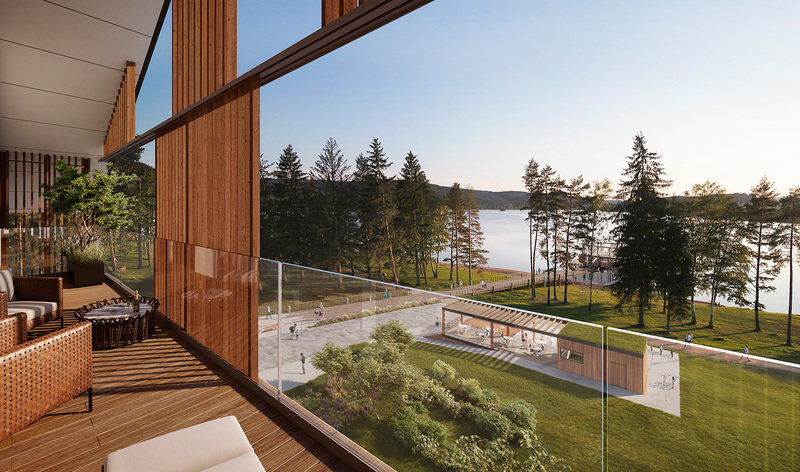 The large-format French windows will provide beautiful views of the Lipno lake or the trees in the garden. The frames are wooden and they are fitted with insulating double glazing. Your second home I want to know more! The company is registered under File Number C 300762 at the Municipal Court in Prague. If you have already inquired about the apartments of the Molo Lipno project, please fill in your registered email. We inform you about processing of your personal data. 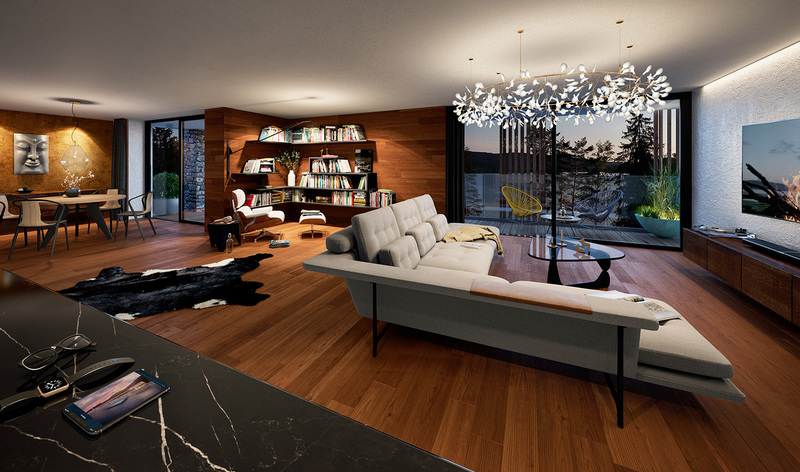 This registration of the preliminary interest in the luxury project MOLO LIPNO RESORT is done in order to prepare you the offer of apartments in this project and to allow you a preferential choice from the offered apartments according to your requirements and to inform you about apartment prices and further development of the project. By submitting your registration you agree to the processing of your personal data. More info HERE..